Tomorrow is the big day for 27 authors in the Bessemer area. 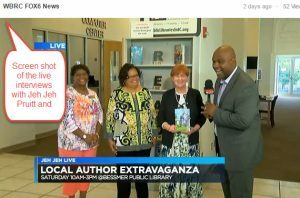 The 2nd annual Author Book Signing Extravaganza will be at the Bessemer Public Library. I will join other authors at 400 19th Street North, (Bessemer, AL) beginning at 10:00 AM until 3:00 PM. This event has been successfully arranged again for the main benefit of READERS, the spirit and purpose of a library and authors. With very careful, quiet advance planning, the organizers have set up an attractive plan which flourishes under the bright attention of WBRC FOX6 television in Birmingham. Jeh Jeh Pruitt’s live interviews were well received earlier this week. The authors who participated in the show had a great experience and found new friends in Jeh Jeh and the WBRC team. I hope you were able to watch the interview on Jeh Jeh Live! And if you are able, come down to the library to meet me and other local authors. I’ll be ‘joined’ by several of my books, particularly the personal “Mother, Can You Hear Me?”, a Bessemer story of the time I spent with my mother as caregiver while she battled Alzheimer’s. Thank you, Readers and Angel Pack members, for all of your generous support for the books I have written and the stories that are in progress. Without you, it would not be nearly as much fun! I’ll be there — Keep your hat on so I’ll know ya! The Bessemer Public Library will host the 2nd Annual Author Book Signing Extravaganza on August 20, 2016. I’ll be there among over 27 authors who will be eager to meet readers and show our books. The doors open at 10:00 AM and we’ll be there till 3:00 PM at least. If you can be at the Bessemer Public Library, 400 19th St. No, in Bessemer on that Saturday (08/20/16), I would love to see you and get acquainted. In preparation for the Extravaganza, I’m so honored and excited to have a televised interview with Jeh Jeh Pruitt, a local Fox 6 news reporter. We will be talking about the Author Extravaganza event. We’ll talk on Tuesday morning and the interview will air at 8:20 here in Alabama on the Fox 6 Morning Show. Jeh Jeh Pruitt began his television career in Alabama as an intern during his college days. He worked at a station in Midland TX for awhile before returning to Birmingham where he is a favorite among co-workers and in the community. If you can tune in, that would be so much fun to know. If you are at a distance, I will get a link as soon as possible and be telling more about the interview. Ireland — Here I am! As October days come racing down the calendar, I’m getting more excited by the moment. Being the only American author included in the Claddagh Author Event in Dublin’s Croke Park on October 8, 2016 has left me thrilled, distracted and busy planning. I know that the next few weeks will speed past as Ireland’s gardens begin to deliver colorful zinnias, Gerber daisies, aster and maybe some sunflowers among the bright drifting autumn leaves. I can close my eyes and picture all of the lovely sites awaiting me! As you, dear readers know, I am deeply steeped in everything Irish — history, mystery, paranormal, food, scenery and more. 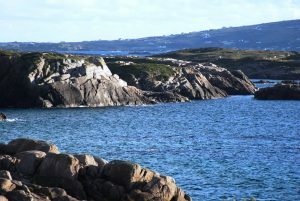 This photo of the rugged Maghery Coast inspires me every time I see it. It seems as though many of you enjoy this view with me. The blues are truly that bright! Good friend, Parris Afton Bonds, plans to join me on this trip to Ireland. I anticipate renewing friendships that grew when I last lived in Ireland for too little time. Visiting some favorite places to steep the writing muse in atmosphere is a highlight of my “Irish plotting” — setting the scenes and anticipating actually being right on the favorite spot! I invite you to join me on my Facebook page to share my photos from the earlier trip and to keep updated in the moment. I’ll be posting some of the experiences I had while living in Ireland and writing travel articles in the blog. I’m looking forward to the big day in Dublin meeting other authors and readers who will be touring the Claddagh event. This event has been popular for several years. When I see the posts on the Facebook page talking about all of the planning that goes into making an event for 200 authors, I’m more impressed than ever. And I appreciate the consideration that the committee members gave my pleas to be included. I’ll be taking a few copies of some of my books — favorites trying to find their way into crowded luggage. I expect their places will be filled with some brilliant books from the Irish authors for the return flight. Events such as Claddagh and some of the terrific events planned right in my Alabama neighborhood are truly an encouraging boost to authors who are permitted to participate.Being able to network with other authors and meet readers in person inspires a great deal of my writing. My appreciation grows with each one for the planners who put their hearts into bringing this off. I’m pleased to see the support the planners receive from their community at the Dublin Eventful website. (The name Dublin Eventful tickles me — someone who bubbles with fun must be behind that) The idea of flying to Ireland for a book fair has me walking on air while I appreciate all the work planners have put in for the entire year — they must be setting their ideas and imagination loose for the next year as they are wrapping up the current event. Thank you for your patience with your giddy friend/author as I’m trying to keep myself calm, cool and collected. (It is NOT working!). Your friends may wish to get their own email updates on the Dublin trip….They can have that with free membership in the AngelPack. If you just share this post with them, they will have a link to the AngelPack page. I have a writers’ conference coming up soon in Pennsylvania. I’ll be presenting a couple of workshops there during my six-day stay. The title of one of my workshops is called Rising Out of the Ashes. When I was a young mother of a toddler, I lived in a tiny old trailer. On this particular day, I had a compelling urge to strip the beds, clear out the closets and wash everything in sight. So, I spent hours gathering clothes and linens together to take down the road to the Laundromat, even though I’d just washed many of those things the day before. But the urge was so strong, I followed it and made a second trip to the nearby Laundromat to wash the already clean clothes. Thirty minutes or so after I’d arrived at the Laundromat, I heard a deafening explosion, and when I ran out to see what it was, I saw my trailer—what was left of it—in flames. It had exploded from a malfunction in the propane heating unit. I watched it burn, not knowing what else to do. Later that evening, I walked among the ashes of what was my former life. But among those ashes, I found two items that were not burned. In fact, they weren’t even singed, no marks on them at all. One of them was my family Bible, a beloved heirloom from many generations before me. Another was my black and white speckled writing journal. I have no explanation as to why these two objects remained untouched. But the fact that they did has remained with me as a sort of guide. 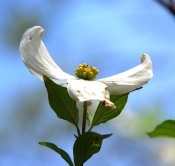 Whatever happens to us, whatever troubles befall us, we have an unseen presence that helps us rise up out of the ashes. When I speak of this incident, I refer to it as a “God thing” because I believe that God saved me and my daughter from dying in that fire and that angels rescued my Bible and writing journal. It could be merely a coincidence, but I prefer to think that there was a greater power at work with a divine purpose in mind. Achieving that purpose? Maybe it’s impossible, but maybe, just maybe, I can touch the hem of that garment. 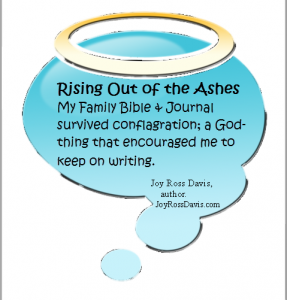 When I share my motivation and experience, I want writers who are at the conference workshop to be able to use Ashes as a guide to the acknowledgment of their own experiences and leading. I intend for other writers to recognize in their own experiences those leading moments which motivate their one desire or drive to write. Author lesson number 17, learned fast and sometimes with difficulty. 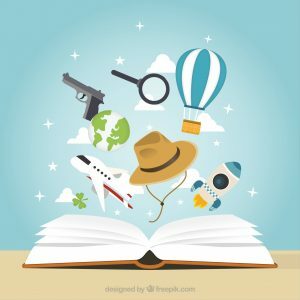 The author will do most if not all MARKETING! As a result, I’m always watching for places to let readers know about my stories. The Internet is a wonderful highway to have ‘billboards’ about the stories I write. I watch for appropriate organizations to participate in. I use social media as much as I can. I connect with people who are connected to readers. The list is growing daily of places where I can encounter readers. The newest venue is named The Reader’s Bookshelf. This could almost be called BOOKSHELVES because there are multiple ways that readers can find a shelf full of books, become familiar with the authors that they like and grow into avid fans who are waiting for every new story their favorite author offers. There is a profile about me and my books at The Reader’s Bookshelf website. The managers of The Reader’s Bookshelf maintain a Facebook page where readers can engage with authors; I know that I enjoy conversation with readers who like my books and my style of writing. The Reader’s Bookshelf offers some social media push through the people who are keeping the bookshelf full of books. Authors who are members may be featured in an interview posted on the Featured page of the website. 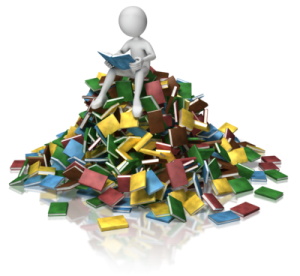 The Reader’s Bookshelf has also partnered with a proofreader/editor who is available to work with authors to get their book ready for publication. Have you joined the Angel Pack? Or do you have friends who would enjoy reading my books? Please tell them about the Angel Pack and recommend that they sign up as members. I really appreciate all of you.